- Turmeric is a powerful anti-inflammatory and antiseptic, useful for bronchial asthma, chronic cough. - One of the main causes of eye disease, especially cataracts, is the oxidation of lens in your eyes. Turmeric taken internally decreases the oxidation of the lens by causing a significant induction of glutathione-S-transferase isozyme rGST8-8 in the lens epithelium. - Oxidation by free radicals is linked with accelerated aging and virtually every major chronic disease including atherosclerosis, cancer, cardiovascular diseases, cataracts, and rheumatoid arthritis. One way to stop this is with anti-oxidants like Vitamin C and E and Turmeric. - Turmeric has an anti-coagulant action, keeping the blood thin.Turmeric prevents platelets from clumping within blood vessels, making it effective in the prevention of atherosclerosis and its complications. Termeric lowers cholesterol levels by preventing and removing oxidized cholesterol. - Turmeric has protective action on intestinalflora.Curcuma is beneficial in Crohn's disease and ulcerative colitis. - Applied topically, turmeric is also useful in treating skin conditions such as eczema, psoriasis, fungal infections and athlete, s foot. - Curcumin has been shown to have Anti-Cancer Properties. In other tumors, it has been demonstrated to inhibit tumor growth and stimulate apoptosis, an intracellular mechanism for cells of all types to "kill" themselves. Turmeric is considered to be anti-cancer because it has a triple action: It neutralizes those substances and conditions which can cause cancer; It directly helps a cell retain its integrity if threatened by carcinogens; If a tumor does grow the Curcumins can often destroy it. Ayurveda especially recommends Turmeric for cancers of the female reproductive system, namely breast and uterine cancer, and to treat benign tumors as well.Turmeric is also useful in cancers of bowel and colon. 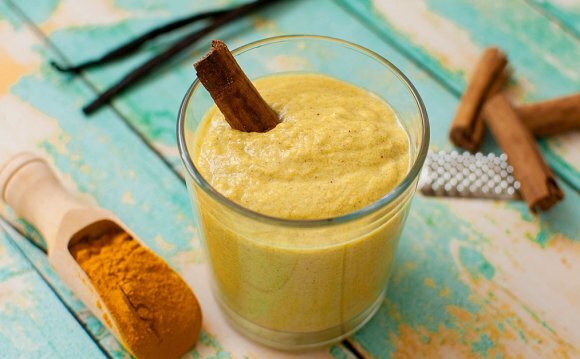 Curcuma can prevent prostate cancer. - As a rich source of iron, turmeric is valuable for anemia. - Turmeric is such a deep purifier that it, like Tulsi, can ostensibly purify at the chakra level (nadi-shodhana), purifying the channels of the subtle body. Long term use of Turmeric, Tulsi and Triphala can be likened to a short term Panch Karma treatment. - Turmeric helps stretch the ligaments, and thus is useful for regular hatha yoga practitioners. - Turmeric prevents the formation of gas, particularly when it is added to a high protein meal. - Turmeric is an important herb in most Ayurvedic treatments of diabetes as it lowers blood sugar, increases glucose metabolism and potentates insulin activity more than three-fold. It serves both diabetics and those of us who binge on sweets. Part of the action might be due to its chromium content. - Turmeric relieves inflammation of the tonsils and congestion in the throat.This also works for stopping nosebleeds, helps to clear the sinuses, restore a more acute sense of smell, and helps to purify the mind and brain. - In vitro and in vivo studies show curcuminoids can help with HIV in a number of ways, including acting as biological response modifiers, resulting in significant increases in CD-4 and CD-8 counts.